I am going to start by saving that I love Gemma Malley so I'm probably a bit biased in this review because I was so glad to finally get my hands on a copy of this. 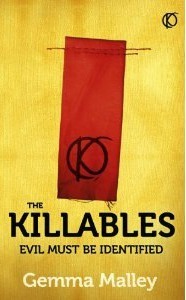 The Killables is a dystopian vision of a world where Evil is eradicated from society and people are labelled according to their goodness. The story centres around Evie and Raffy. Evie is matched to Lucas but in love with his brother Raffy. Evie is torn between the idea of being good and serving society as best as she can. She goes to work and follows the rules as best she can until Raffy does something that means society decide they are going to reclassify him as a K. Without hesitation she decides to take Lucas's offer of help to get out of the city with Raffy and try and find somewhere safe to run to. Once outside the city and the system they've been forced to live in there are so many revelations which turn the world Evie and Raffy think they live in on its head. I loved seeing how their world view changed more and more the longer they spent outside. I can already see that some people are going to slate this book and compare it to matched after they've read the first few pages. All I can say to that is the world built up is different and done so much better. There are so many ideas set up which are going to awesome once they are developed. This sounds great! I must check it out!